For our latest blog, Hannah Sibai talks about their inspiration behind designing the set for Ghost Girl // Gwei Mui 鬼妹. Ghost Girl // Gwei Mui 鬼妹 is playing until Sat 9 Feb at 7:15pm. Click here to find out more. There are no hard and fast rules for designing theatre sets. Sometimes I prepare a model box months in advance of start of rehearsals, sometimes I design throughout the rehearsal period itself. With Gwei Mui we started with a script that was based on several weeks of research and development, some of which I attended to get a feel for the tone of the show. 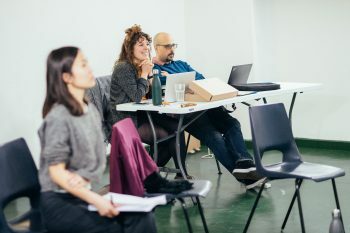 The first draft of a script landed in December 2018 and it made sense to go into rehearsals in January with a ‘template’ for the set design which would then be refined as the show was developed further. The director Jen Tang was keen to use the script as a “map”, a starting point that would be used to inform periods of devising in the rehearsal room. Jen didn’t want to be literal when creating spaces in the story, such as the school or a living room. Therefore it became clear to me that the set needed to not only feel like a blank canvas, it also needed to be a blank canvas – a neutral and controlled space where the many locations and abstract worlds of the show can come to life. This led to the idea of a white rectangle of flooring which throughout the rehearsal process has been transformed into a game board, a bedroom, a map and a shrine, through minimal use of props. Jen and I were keen to embody order and chaos in the design: order within the set and chaos created by the performers that inhabit it and the mess created by props. Performers are either within the stark white world or on the other side of it in the black floor of the studio, as outside disembodied voices. A practical structure we also needed in the space was a surface we could project onto. Jen knew this quite early on so I was keen to integrate this into our environment rather than use the projection screen already rigged in the theatre space. I have a bit of a rule when designing for projection: I try not to use a surface that looks obviously like it’s waiting to be projected onto. I want it to be something that exists as a beautiful set piece in its own right. In previous designs I’ve used a piece of floor bent into an infinity curve, some bright red welding screens, a quilt cover, a parachute, between the mouldings on a wall of a lavish room… the list goes on! In this case Jen and I were really inspired by clean lines and minimalism. In the end we decided to create 7 hung fabric panels of different transparencies that overlap. The shapes are inspired by the long thin paintings in classical Chinese art, and are a multiplication of the shape of our white floor (it took me hours to find fabrics with exactly the right colour, texture, transparency and practicality!). I’m interested in how the layers relate to the concept of identity and can be read abstractly, or as something more domestic like pictures or window blinds. To cut through this very pure space I wanted to add something modern and jarring that can act dynamically in this static space. Jen and I discovered Neon Flex which is a flexible neon light source that will frame our playing space. It will not only highlight our very defined perimeter but it can pulse, flicker and chase to highlight and support our story beats. I’m excited at how this clean pure space transforms when bodies, props and costumes are on it!